For nearly 20 years, the anthology series TWO LINES: World Writing in Translation has published international literature in translation. 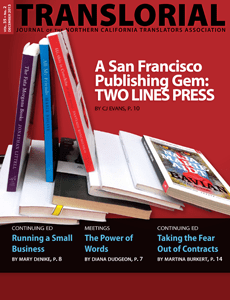 This effort led to the launch in 2012 of Two Lines Press, a San Francisco-based publisher that is an offshoot of the nonprofit Center for the Art of Translation. Recently, Two Lines editor CJ Evans was kind enough to reveal a bit about the inner workings of this local publishing gem. 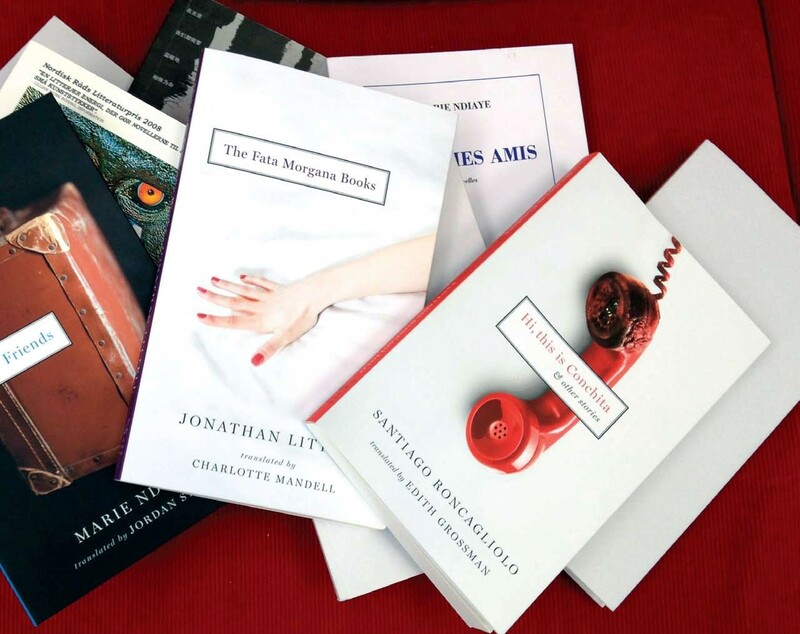 The mission of Two Lines Press is to make great international literature accessible to an English-speaking audience, and also to celebrate the art of translation—the essential role translators play in the creation of a work of literature in English derived from a foreign text. Olivia Sears, an Italian translator and the founder of the Center for the Art of Translation and Two Lines Press, is from San Francisco, which is part of why we’re here on the West Coast, but we also consider ourselves an alternative to the New York-centric publishing scene. To be on the West Coast gives us a bit of distance from the occasionally myopic tastes and styles of publishing, and allows us to more directly champion the work of the large number of excellent translators who don’t live on the East Coast. One of the reasons we launched the press is that we believe we are facing a tipping point in the publication of literature in translation. With huge bestsellers like Steig Larssen, literary touchstones like Roberto Bolaño, and smaller houses devoting more of their limited lists to translated works, we think there will be much more competition and interest in international literature in the coming years. There is a huge number of truly excellent international literary works that have yet to be translated—we often pass on excellent books that deserve to be published just because we don’t have space on our list. With book sales in decline and big chain bookstores closing their doors, I think there is a great opportunity for smaller, more adaptable publishing houses, and those houses traditionally have more interest in international literature. We’re a small office, and titles are chosen for publication when a consensus is reached amongst the people who work here. Myself, Olivia, Scott Esposito (our marketing manager and an excellent critic of international literature), and Emmy Komada all read samples of potential manuscripts, and we publish what we deem best and most appropriate for our list. We also rely heavily on our community of translators, both for suggestions on what to publish (since they, as a general rule, are much more plugged in to what interesting literature is happening in their chosen region) and to write reader’s reports on untranslated manuscripts. In many cases, once we’ve chosen our titles we must then find a translator. We often solicit translators who have done books we admire, or who have published excerpts we liked in Two Lines. We’re invested both in working with translators who have been doing excellent literary translation for a long time, such as Edith Grossman, who translated Santiago Roncagliolo’s Hi this is Conchita (the first book we published at the Press), as well as seeking out interesting new translators. We also review unsolicited submissions from translators through our website. A sampling of the many excellent translated titles available from TWO LINES PRESS. They also offer a variety of engaging discussions and interviews via podcast and blog. The first thing I look for in a prospective translator is outstanding writing skills in English. Without that rare gift, no level of fluency in a foreign language is going to make a literary translation excellent. Translating is, in many ways, more difficult than writing a new text; you must devise creative solutions across languages. I think it’s very important for a translator to be reading heavily in their chosen language, to be familiar with the styles, modes, and influences of the author they are translating, but also to be reading contemporary American literature—to know what the American readership is looking for. At times it’s difficult to get the attention of reviewers and book buyers for works in translation. But being a nonprofit keeps our expectations of sales in check, and we maintain a very selective list so that we can put a lot of effort into each title. Don’t get me wrong, having a bestseller would be great, but that’s not the type of book we’re trying to publish, and that’s not the model we’re working with. We feel that if we publish excellent books by excellent authors whose reputation in America will only continue to grow, we’ll see sales of those books long into the future. Cultivating a varied and strong backlist is a much more sustainable model for a small press than banking on a hit. Financing translations can be a tricky business. I have worked with translators to get grants to fund their translations, and have applied for many grants to support our publications, which in turn helps us maintain a higher pay rate for our translators. Often the American publisher who will publish the book must apply for the grant, but not always. The difficulty with translation grants is that the application process may be either simple or complicated and time-consuming. For some languages, no grants are available at all. The National Endowment for the Arts is doing a great job of expanding their grants to translators—they just gave away a quarter of a million dollars to help with projects in 2013—and PEN has an excellent program for translation as well. The best advice I have for language or country-specific grants is to send an email or call the country’s U.S. cultural attaché. If a translator is hoping to place a book with a publisher in the U.S., it’s wise to include results of preliminary research into funding opportunities in the query letter, so that the publisher can make a more informed decision about whether the book will be economically viable. Often the availability of a five or six thousand dollar grant is just enough for a publisher to take a risk on a title that they don’t anticipate will fly off the shelves, but that they recognize as great, important literature. Learn more, get involved, shop online, or make a donation to the Center for the Art of Translation. kim posted this article under Literary Translation	on Sunday, December 1st, 2013 at 12:09 pm	You can follow any responses to this entry through the RSS 2.0 feed. Both comments and pings are currently closed.